Light, funny, romantic. These are the words I would use to describe When In Rome, the romantic comedy starring Veronica Mars‘ Kristen Bell, and Las Vegas’ Josh Duhamel. (Both shows are cancelled, and have been for a few years.) Lately, when it comes to Hollywood, there have been very few good romances or romantic comedies suited for girls. In the past few years, thanks to Judd Apatow, there have been plenty for guys in the form of Knocked Up and Forgetting Sarah Marshall (of which I did enjoy and also had the spunky Kristen Bell). But girls like to watch romanticcomedies to laugh, to cry,and basically go “awww….”, a quality missing in ever so famous vulgar romances we’ve lately been subjected to. 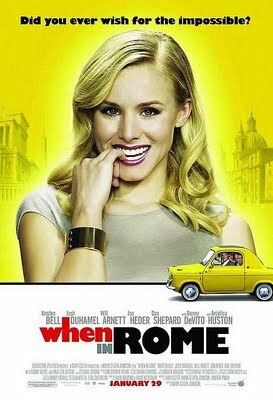 When In Rome has none of that special, almost fairy tale shine that modern classics such as Sleepless in Seattle, but it is certainly fun, enjoyable and full of scenes that will make you laugh. It is perhaps a bit less romantic than The Proposal, from earlier this year but it has enough of it to keep this chick flick addict satisfied. Kristen Bell plays Beth, a museum curator for the Guggenheim in New York City, who loves her job more than any guy she has previously met. On a trip to Rome for her sister’s impulsive wedding, Beth meets handsome and charming Nick (Josh Duhamel). Just when she’s about to give love a chance, she is disappointed by something she sees and on a tipsy whim, decides to step into the “Fountain of Love”. It is said that the “Fountain of Love” brings love to anyone who throws a coin over their shoulder and into the fountain. Beth, who knows this story, decides to “save” 5 people from their state of desperation for love and takes 5 coins from the fountain. This causes a spell to be cast, and all five people are now “in love” with her. Back in New York, Beth finds five people (Danny DeVito, Jon Heder, Will Arnett, Dax Shepard) now chasing her wherever she goes, including Nick. All of them are fighting for Beth’s love and adoration, which confuses and scares her. In the midst of the chaos, she discovers the cause of their craziness and also finds herself falling in love with Nick. But does he really love her or just simply under a spell? The story is very simple, but laughter in the movie is a plenty, as the four guys chasing after Beth have clearly gone crazy for her. (Nick seemingly remains the most sane… sort of.) This is what makes When In Rome so funny, and less of a romance and more of a comedy. With a history for writing family friendly scripts, the story was written by David Diamond and David Weissman, writer of Old Dogs, and the wonderful movie from 2000, The Family Man. The scenes and shots of Rome and New York City are beautiful, and reminds me of the wonderful days I spent in both cities. Don’t expect a great script or terrific acting (though I am quite partial to both Josh Duhamel and Kristen Bell). However, if you’re looking for a light and fun movie to watch after a busy or stressful week, this is a great movie to go and checkout. This one is good enough for the entire family as it does not include any swear words, vulgarity — just a bunch of slapstick humor. And, if it’s any indication what a good chick flick this is (for those chick flick lovers like me), girls sitting in the same row, varying in age (clearly not in their teens, probably in their 20s), kept on oohing and awwing with every cute moment in the film. My suggestion though — keep your oohs and awws to yourself, and you won’t annoy the person next to you and STILL enjoy the film!